A vicious triad head (Roy Cheung) - who has some supernatural abilities - is burying someone in a location that will bring the dead man 10 lives of bad luck. Roy then goes to the dead man's girlfriend (also dead)- Chingmy - and slices off her skin - makes a lantern with it - and imprisons her soul within. Jump ahead to 1993 and Tony Leung is a low-end triad member. His entire life has been a series of bad luck and misfortune. 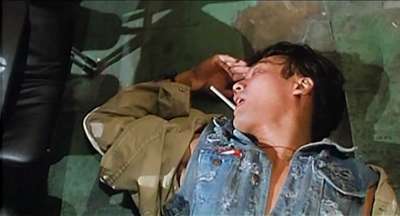 Leung ends up in hospital where a man tells him to seek the help of Granny Four to understand what is happening to him. Granny Four is a spiritualist and is able to show him his past life and the story of his love for Chingmy and their tragic ending. Chingmy also comes to him (in spirit form) and tells him that she has been waiting for him for thirty years and that he must free her soul from the lantern. Ghost Lantern was an impulse buy I made about a year and a half ago when I was going through a Chingmy Yau phase. I thought she was da bomb, to quote a phrase, and was trying to get as many films as possible which she starred in. This one was quite high up on my list as it appeared to be about ghosts, and I like a good ghost story I do!! The film opens with the aftermath of a couple of murders. A man is being buried in cursed ground which will bring his next ten reincarnations nothing but complete bad luck. In a room somewhere else a woman lies dead, and her back is skinned by the same person who buried the man, and is made into the outer material of a lantern. The man behind all this, Hung (Roy Cheung), clearly has some black magic mystical knowledge and powers, as he states that as long as the lantern light remains on, the woman's spirit will forever be trapped in the lantern, and she will never be able to reincarnate. Jump ahead about 30 years or something like that and we meet Fai (Tony Leung Ka Fai), a member of a triad, but someone who we soon find out is plagued by bad luck. 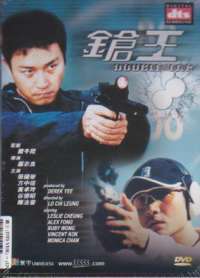 Fai is also a police informant or Officer Kong, but he never manages to provide good information, due to his bad luck. 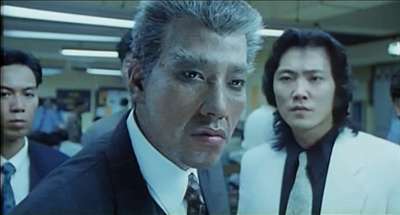 Things come to a front when Fai's triad end up in an all out fight with the triad run by Hung (Roy Cheung now with a major make up job to make him look older!). However, he is saved from being killed by a ghost (Chingmy Yau), as the police arrive to break up the fight. In the resulting questioning Hung sees Fai, and recognises him as the first reincarnation of the man he had killed years in the past. This meeting sparks some memories in Fai's head, but he has no clue as to what they are or why he is seeing them. With a few more mysterious happenings, he goes to a mystical woman who helps him see his past life and the love and suffering which he had in that life. I actually found the story in Ghost Lantern to be quite interesting and entertaining. It wasn't just random fluff being there just to set up scares or fight scenes, like is the case for a lot of films. It had a gruesome and violent side to it, which is shown primarily at the outset, but is then developed and explained as the film moves on. This approach, for me anyway, helped draw me more into the story, as I wanted to know why those two people at the start were killed, and what they had done to merit such cruel treatment in their death. Unfortunately while the story itself was interesting, the film does at times try its best to lose this focus and become a farcical comedy, before jumping back to serious mode again. So many Hong Kong films are plagued with this out of place style humour that it really just has to be accepted as part and parcel with Hong Kong cinema. For me though, accepting it doesn't stop it ruining the flow of the film! In themselves, the comedy moments are reasonably funny, so at least they have got that going for them, but the rest of the film is quite violent and romantic in the relationship between Fai and Chingmy Yau's character Yung, and this tone is by far the better and more suited to the film than humour. Despite liking the story, I have to be honest and say that the present day scenes just don't work as well as the flashback scenes. I don't know whether it is because I find the bad luck, present day Fai to be just a touch annoying, and the same with the cop Kong, but the film does fall a little flat in these scenes. The flashback scenes, however, are far better and are what make the film. The mood, the characters, everything really, just seems to work. Nothing is over the top, it is all realistic and believable. But in the present day, the same does not apply, things are more over the top and not as realistic. This could be explained by the presence of magic and ghostly figures, but I genuinely believe that had the same tone and mood been kept for these present day characters, the whole film would have been much better as a result. Acting wise, Ghost Lantern is a little bit of a mixed bag. I'll start with your regular hard guy Roy Cheung. As Hung he does a good job of showing someone who is a powerful triad boss, and is suitable evil to make his actions believable. In general though, and particularly in the scenes where he is showing off his iron body strength, he really does come across as a hard-as-nails b@stard! His make up job for the older Hung does leave a little to be desired, in my opinion, although that is very likely due to budget restrictions. For proper acting ability rather than cuteness, action scenes and all that sort of stuff that can be used to distract from the acting, I have to say that I think this is one of the better performances I've seen from Chingmy. Granted she does also look unbelievably cute at times, so maybe I am being a little biased, but I thought her performance was the best out of all the cast in the film. Tony Leung Ka Fai is the person who puzzles me the most in Ghost Lantern. As the present day, bad luck riddled Fai I found him to be so damn annoying! I thought his acting was pretty poor at first, but I think this was probably just meant to be his character. The character came across as very cowardly and weak in body and mind, and the acting came across as being very whiney and moany. However, in the flashback scenes you could be forgiven for thinking that it was some other Tony Leung Ka Fai acting the past Fai. Here the character was completely different, a strong and confident person, and the acting portrayed this very well. The delivery of the speech wasn't whiney, and it certainly seemed like it had far more feeling behind it. 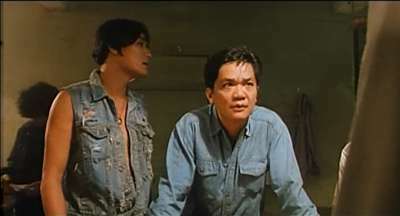 Those flashback scenes cetainly restored my belief that Leung Ka Fai can act. The last of the main characters is Officer Kong. I can't remember at this time what the actor's name is, but I've seen him in quite a few films, and to be honest I've never been overly enamoured with his performances. More often than not I do find him to be a tad annoying, mainly due to his characters. This one will just blend into obscurity as one of the many films I've seen him in, where he didn't give an great performance, but fortunately didn't give a terrible one either. Just kind of non-descript with a touch of annoyingness. Ghost Lantern is a film which crosses several genres to reasonable effect, but is let down by not sticking to one film mood and as a result the flashback and present day scenes seem a world apart in style. Anyway, the film definitely had potential of which some has been realised, but alas not all of it. This limits any repeat viewing attraction, and I honestly think that watching it once will be enough for most people. But that one viewing is entertaining enough to be meritted. Ghost Lantern features a choice of Cantonese or Mandarin stereo, and with Cantonese being the original language for the film, that is what I chose. It became quite apparent after watching a few minutes that the audio for this film was definitely post-synchronised, as the speech is not in time with the mouth movements. That being said, there wasn't really that much to complain, or really praise, about the soundtrack. It wasn't full of life and great crystal clarity, but neither was it dead and flat sounding with inaudible bits. It is a stereo track that gets the point across, but without any flair and flamboyance. The subtitles, unfortuantely, are burnt onto the film print, and not digital removable ones. They also don't have a black border behind or around the text, so on light backgrounds, they are difficult to read. There are a reasonable amount of grammar and spelling errors, and in some cases whole words have been missed out. I don't recall there being a point where it wasn't possible to understand what the subtitles meant, but it was quite annoying at time having wrong spelling and bad grammar. 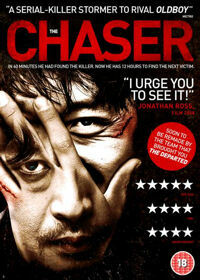 This is something a lot of long term Hong Kong and Asian cinema fans have gotten used to though! Another downside is that there is a paragraph of text on screen at the start of the film which is not subtitled, and and Chinese characters which appear on screen in the film are not subtitled either. The letterboxed film print for Ghost Lantern is pretty much standard of a lot of the earlier Mei Ah released films. In other words it is not too great. There are quite a lot of speckles and the like on the print throughout the film. Add to this the fact there is also clear evidence of colour bleeding in some scenes, that the print does appear too pale in places, and that the print is reasonably soft, as there is no sharp fine detail apparent on screen. It is still watchable, but good have been a lot better. Extras are a minimum here. The only extras are two trailers, one for Ghost Lantern, and one for Take 5. No great mark here. Ghost Lantern is a film which I found to be quite interesting, but was let down by possibly too low production values, and some annoying acting in places. I think it is worth watching for one viewing but it doesn't really have any repeat viewing potential, as there are so many other films out there which are better for each of the genres that this film crosses. Regardless it is still reasonably entertaining.